Feel like you’re in the Scottish highlands while you eat an Irn Bru-based dessert that comes with a side of deep-fried Mars bar (yes, actually). Big name restaurants opening in Dubai is nothing new, but it is rare for them to bring the original furniture over. That’s why Copper Dog is just a little bit special – no expense has been spared in recreating the famous Scottish highlands pub. Everything from the tables and chairs to the floorboards, stone work and even some of the drinks glasses have been brought over from Scotland to a new home in JBR. The effort was worth it. Bar the heat outside, you really do feel like you’re stepping into a little highland pub, with dark wooden floors, warm lighting and a cosy yet lively bar. 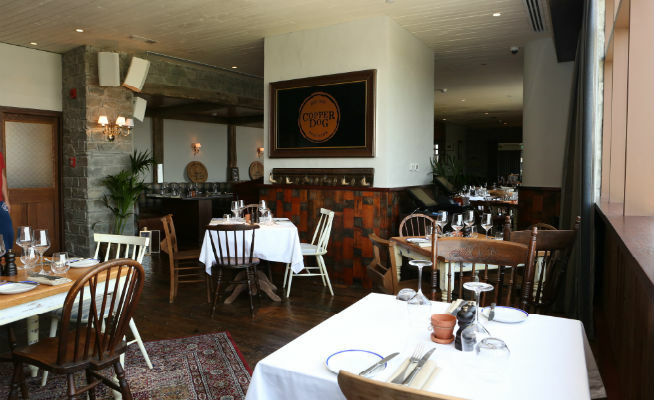 The original Copper Dog is based in the Craigellachie Hotel in Speyside, and is famous for attracting celebrities, with Kate Moss and Noel Gallagher among its clientele. As you’d expect from a Scottish pub, whisky is the main attraction. In fact, there are more than 190 types, with more bottles apparently on the way – a record number in the Middle East. It’s just as much about quality as quantity too, with one particular spirit costing more than Dhs1,000 for a single measure. Not one to put on the tab then. As soon as we walk in, we’re led to a cosy table in the bar and advised to order the ‘half and half’ – a half pint of hops paired with a half measure of spirit by the (very knowledgeable) bar staff. It’s busy but not rammed, with people lounging on sofas, leaning against the bar and happily squeezed into booths. The soundtrack is classic but cool, a welcome change for anyone tired of listening to house music in Dubai’s restaurants, and they do live music nights too. What better way to wrap up your lunch at #CopperDogDubai ?? Deep fried Mars Bar with an Irn Bru sundae!